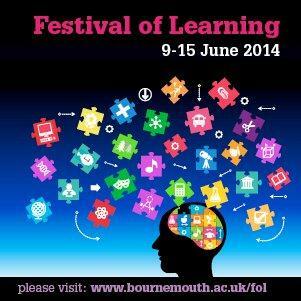 Bournemouth University (BU) is hosting over 150 free events from Monday 9 to Sunday 15 June, as part of the Festival of Learning 2014. There are interactive workshops, hands-on taster sessions, presentations and seminar sessions running throughout the day and evening. Events are grouped within eight themes, including Entrepreneurship and Economic Growth, many of which are specifically designed for businesses and professional development. These events offer an opportunity to network, learn something new or update an existing skill. Subjects covered include computer animation, media production, software systems, artificial intelligence, business incubation, crowdsourcing and more. There are also a wide range of industry specific events that will that will appeal to health and social care professionals and those who work in the creative, digital and media sectors. Last year over 4,000 people came to the Festival of Learning to learn something new, hear about BU research and see how it can impact our everyday lives. The Festival allows professionals, students and members of the public to be part of university studies, research and learning, with the chance to also bring friends and family to pursue a personal interest or hobby and meet like-minded people during the seven days the Festival is running. Whilst you’re taking part in a business event, you might find something else that interests you from the wide range of activities on offer. For example, there’s a Cyber security: protecting your assets event, or Poison is My Business, which is a journey through the history of poisons, including modern day forensic toxicology. To book these or any other event visit the Festival of Learning website or call 01202 962362.